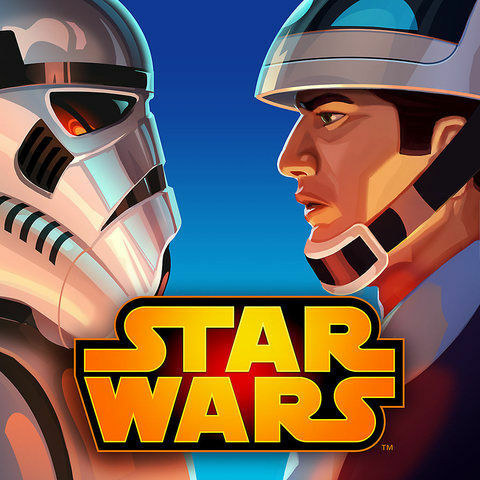 Now it’s time for another episode of “Adam plays yet another social game, knowing full well he will probably hate it and write a scathing review.” Except, Star Wars: Commander isn’t quite what I was expecting i.e. Farmville on Tatooine. At first blush, SW: Commander offers some of the traits I’ve come to associate with this particular sub-genre of non-game. Ideally, the game would have me playing it every three hours, or so, to collect resources that accrue in real-time. There are three types of currency: credits, metal, and gems, the latter can only be acquired through parting legal tender from hand. 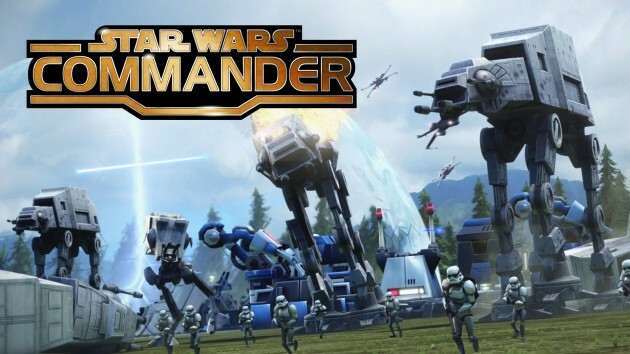 Unlike many social games, which use premium currency as a way of reining in the fun while exploiting the player’s need for more, much like a drug dealer giving a person a taste for free before jacking up the price, the gems of SW: Commander only seem to be used to speed up build times or to buy new construction droids. From this, Commander sets up a business model that will only make money from the most manic of players. The game itself consists of a few phases. The main mode revolves around building a base and positioning fixed defenses for said base. Story missions see players sending troops into battle for either the Empire or the Alliance; picture Command and Conquer without any micromanaging of units, and you’ll have a good idea of Commander’s combat experience. The odd base defence mission is standard fare tower-defence. What’s surprising is there’s no mandatory cool-down period on playing the story missions. Show me a person who hasn’t been spammed with requests to click a link so a friend can have more energy in JuggaloVille, and I’ll show you a person who has never used Facebook. If I’m not playing a story mission in Commander it’s usually because I need to train some more storm troopers, a process which takes all of two to three minutes. Instead of making me feel like the subject of the video game version of the Modified Ludovico, where not harvesting yams every eight seconds evokes soul piercing anxiety, Commander invokes memories of old BBS games where players had x number of encounters per day. It’s enough to keep me playing, but not so overt that I can feel the reward-denial matrix at work. Perhaps this is what happens when an established video game developer i.e. LucasArts (aka Disney) makes a social game. Since they’re stinking rich already, they don’t need to squeeze every penny out of players to break even on the production costs. This means they can actually build something that resembles a game into the “social game” experience. That said, the game aspects of Commander are so pants-on-head easy that a player would have to try to not get a 100% rating in the story missions. Granted, I take no small measure of black-pleasure in watching a mix of storm troopers and dark troopers lay waste to a camp of Tuskan raiders – that’s right, I play as the Empire, baby – but I wouldn’t call anything I’ve done in the game remotely challenging. Sure, it’s fun, but a deeply satisfying strategy game this is not. The same can be said for Commander’s multiplayer aspect. Taking a page from the likes of Clash of Clans, Commander lets players launch PvP attacks against other players. Again, this is a pointlessly easy thing. I’ve scored 100% on both of the raids I’ve undertaken; meaning a small contingent of my storm troopers, dark troopers, and guys on speeder bikes destroyed another player’s entire base. However, if I use my own economy as a baseline for comparison, the spoils of my raids are relatively paltry. Also, if PvP combat follows the model of PvE, the bases I destroyed very quickly rebuilt themselves, offering little in the way of actual inconvenience to my foe. What we’re left with is a game, and I suppose it’s fair to call this a game in the honest sense of the word, that will let players feel like they are winning great military battles against real-life foes, without visiting any lasting damage on the vanquished. This makes sense because Disney/LucasArts wants people playing Commander, not smashing their tablets in frustration because a week’s worth of building was crushed in two minutes. It reminds me of the episode of Star Trek where wars were played out in computer simulations, rather than with bombs and ships. You get the vague sensation of accomplishing something, the short-term gratification of laying your enemy low, and can rest safe knowing the inevitable counter-strike won’t hurt too badly. So it’s an okay game, but it’s not the golden fleece of social games that will bring in legions of hard-core gamers.